Alphabetica Redux revisits the process of drawing with light explored in the 2004 work Alphabetica, which was part of SCAPE Art and Industry Urban Arts Biennial 04, within LightSCAPE, curated by Deidre Brown and Jonathan Mane Wheoki. 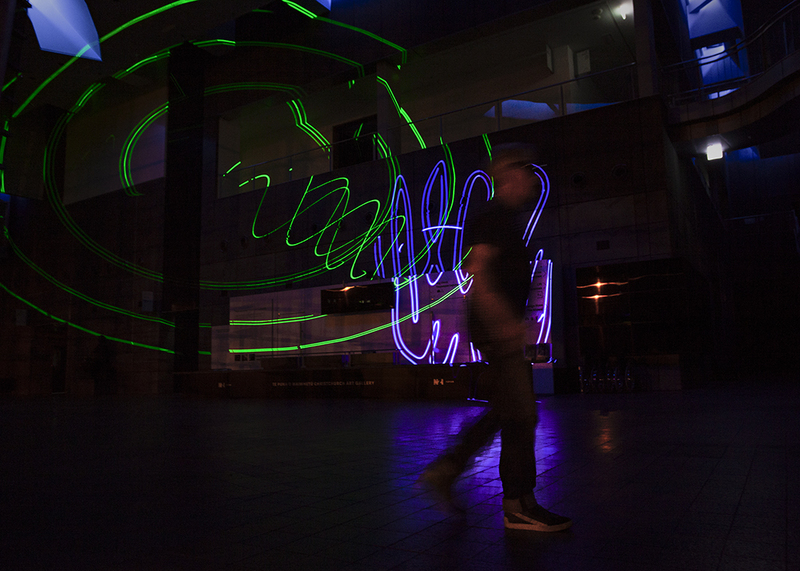 Using the same aqua laser light technology, now capable of rendering a greater suite of colours, Auckland-based artist Paul Hartigan has produced a delicate, dynamic, pulsing activation of space and surface. The live draw element on the opening night brings heightened spontaneity and liveness to the project. 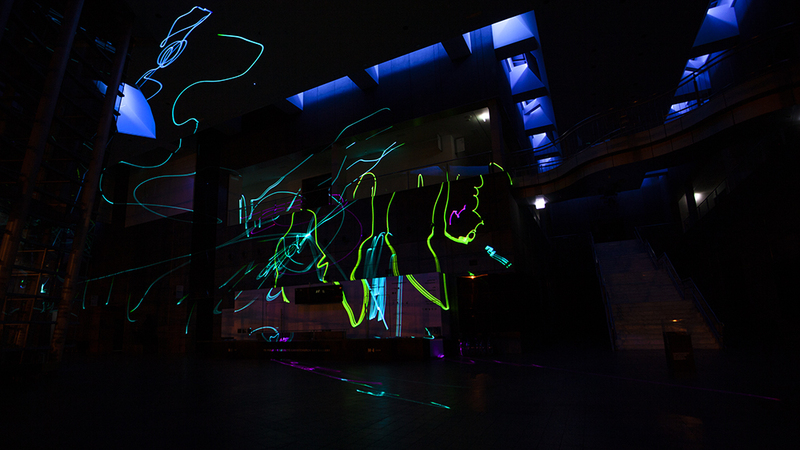 In terms of popular culture, laser light projections became notable within the Disco era of the 1970s and gained global prominence through nightclub and rave scenes in the 1980s and 1990s. While still used in spectacular displays, other technologies like high-definition pixel-mapped imagery projected onto architecture have come to the fore, which infuses this work with a somewhat nostalgic air. Hartigan, widely recognised for his large scale public light commissions (often using neon), also produces paintings, photographs and fine art prints. Hartigan blends childhood nostalgia with contemporary references to create his distinctive urban imagery. Consistently defined by a subversive edge and a darkly witty humour, Hartigan's works are often subtly undercut by astute social and political perceptions. Paul Hartigan attended Elam School of Fine Art 1971-73 with painting teachers Colin McCahon, Robert Ellis, Garth Tapper and sculptors Adrian Hall, Greer Twiss and Jim Allen. At a time when regionalism reigned supreme, Hartigan's internationalist outlook saw him choosing to align himself with the forerunners of the American and British Pop movement. With an artistic career spanning four decades, Hartigan's current work continues to push boundaries and challenge conceptions of both society and self in a visually arresting and timeless fashion.